Taranaki T. May.12 Waikato W.
Harbour B. May.12 Otago GR. Canterbury W May.12 Auckland D.
Otago GR. May.11 Taranaki T.
Waikato W. May.11 Auckland D.
Waikato W. May.10 Harbour B.
Auckland D. May.10 Otago GR. Canterbury W May.10 Taranaki T.
#1. This week's number one is former international power forward Jillian Harmon (185-87, agency: LBM Management, college: Stanford, currently plays in Italy). She was the major contributor in Ragusa's victory against the closely-ranked Lucca (11-4) crushing them 77-49 in the Italian Serie A1 in Sunday night's game. Harmon had a double-double by scoring 14 points and getting 10 rebounds. She also added 2 blocks in 25 minutes on the court. It was the game of the round between two top 4 ranked teams. Passalacqua Spedizioni Ragusais placed first in the Serie A1. It's Harmon's first season with the team. Harmon has individually a very good year with high stats. She averages: 15.8ppg, 8.4rpg, 2.6apg, 1.6spg, 2FGP: 52.8%, 3FGP: 14.3% and FT: 78.1% in 22 games she played so far. Harmon played for the New Zealand senior national team two years ago. #2. Second place goes to an international guard Antonia Farnworth-Edmondson (181-87, currently plays in Australia). Farnworth-Edmondson led Hawks to a victory over the ninth-ranked Lady Bandits (1-1) 79-69 in the Australian State League (second division) on Saturday night. She was MVP of the game. Farnworth-Edmondson scored 21 points and grabbed 8 rebounds in 34 minutes. Ringwood Hawks (2-0) are placed fifth in NBL1 group. But this is still an early stage of the season and everything may happen. Farnworth-Edmondson has very impressive stats this year: 23.0ppg, 5.5rpg, 4.0apg, 2.0spg, 2FGP: 52.9%, 3FGP: 33.3% and FT: 92.9% in two games. She is in the roster of the New Zealand senior national team. #3. The New Zealand player who performed third best last week abroad was an international guard Jordan Hunter (172-90, college: SEMO, currently plays in Australia). Hunter contributed to an easy victory against the second-ranked Eagles (5-0) 94-75 in the Australian State League (second division) in Saturday night's game. She scored 6 points and added 4 passes. It was the game of the round between two top 3 ranked teams in League Premier. West Adelaide Bearcats (4-2) are placed second in Premier League. But the season just started, so everything may happen. Hunter's overall stats this year are: 5.5ppg, 3.2rpg, 2.2apg, 1.8spg, 3FGP: 22.7% and FT: 57.1%. Ex-North Harbour Breeze player is also a member of the New Zealand senior national team. #4. 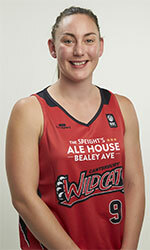 Forward Jessica Bygate (186-92, currently plays in Australia). She could not help Falcons (2-1) to beat Wildcats (1-2). Bygate scored 8 points and added 3 passes in 32 minutes. The seventh-placed Falcons (2-1) were edged 81-80 on the road by the much lower-ranked (#14) Wildcats in the NBL1 group. But the season is still in it's first stage and everything can happen. This year Bygate's overall stats are: 4.7ppg, 3.3rpg and 2.3apg in three games. She is also New Zealand national team player. 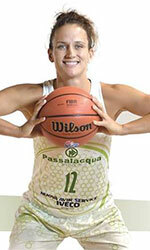 #5. International guard Stella Beck (183-95, college: St.Mary's, CA, currently plays in Australia) was not able to help Tornadoes (0-1) in their last game on Saturday. Despite Beck's very good performance Tornadoes (#16) were edged 87-85 in East Burwood by the much higher-ranked Spectres (#3) in the NBL1 group. She scored 15 points and had 3 steals. It was her first game for Tornadoes this season. The Regular Season already ended. Beck plays currently for the New Zealand national team. #6. Guard Rebecca Ott (182-94, currently plays in Australia) was not able to secure a victory for Knox Raiders (1-1) in their game against Geelong Supercats (2-1) in the Australian State League (second division). She scored 5 points in 22 minutes. Knox Raiders (#8) lost 89-94 in Geelong to the higher-ranked (#7) Supercats in the NBL1 group. But there are still lots of games to play and it's a long way to go. Ott has relatively good stats this year: 12.5ppg, 4.0rpg, 3.0apg and 1.5spg in two games. She is a former international player as she played for the New Zealand senior team two years ago. #7. An experienced U18 international swingman Sofia Kennedy (174-0, currently plays in Australia) is a teammate of previously mentioned Jordan Hunter and both played together in the last Australian State League game. Kennedy managed to help West Adelaide Bearcats to win against the second-ranked Eagles (5-0) 94-75. She scored only 3 points. Kennedy's total stats this season are: 1.8ppg and 1.7rpg. She is also New Zealand U18 national team player. #1. Keziah-Brittany Lewis (178-G-95, college: Kent St., currently plays in United Kingdom) contributed to a 3-point Newcastle Eagles' victory against the ninth-ranked Lions (6-13) 59-56 in the British WBBL last Saturday. She scored 6 points and grabbed 6 rebounds. Newcastle Eagles (20-10) is placed third in the WBBL. There are only two games left until the end of the Regular Season. So now every game will be critical. Lewis' overall stats this season are: 4.7ppg and 2.8rpg. She has a dual citizenship: New Zealand and Cook Islander. #1. This week's number one is former international power forward Jillian Harmon (185-87, agency: LBM Management, college: Stanford, currently plays in Italy). She was the major contributor in Ragusa's victory against the sixth-ranked Lucca (9-11) crushing them 92-60 in the Italian Serie A1 in Thursday night's game. Harmon recorded 20 points and grabbed 6 rebounds in 30 minutes on the court. Passalacqua Spedizioni Ragusais placed first in the Serie A1. Harmon has individually a very good year with high stats. She averages: 15.9ppg, 8.3rpg, 2.7apg, 1.7spg, 2FGP: 52.3%, 3FGP: 15.4% and FT: 77.5% in 21 games she played so far. Harmon played for the New Zealand senior national team two years ago. #2. Second place goes to an international forward Jacinta Beckley (185-95, agency: AgainHello, college: Seattle, currently plays in Hungary). Beckley led BEAC-Ujbuda to a victory over the closely-ranked Vasas Akademia (6-16) 84-80 in a derby game in the Hungarian A Division last Saturday. She was MVP of the game. Beckley scored 21 points and grabbed 6 rebounds; quite an impressive performance considering it's only her third season in pro basketball. BEAC Ujbuda (5-17) is placed tenth in the A Division. They ended the series of six consecutive loses. The Regular Season already ended. Beckley's overall stats this season are: 8.7ppg, 2.8rpg, 1.3spg, 2FGP: 39.2%, 3FGP: 36.8% and FT: 66.7%. Worth to mention she played also at Eurobasket Summer League, which helped her get the job in pro basketball. She is in the roster of the New Zealand senior national team. #3. The New Zealand player who performed third best last week abroad was an international guard Antonia Farnworth-Edmondson (181-87, currently plays in Australia). Farnworth-Edmondson was the main contributor in Hawks' victory against the 19th-ranked BA CoE (0-4) 83-72 in the Australian State League (second division) in Saturday night's game. She was the best player in that game. Farnworth-Edmondson scored 25 points and added 7 assists. It was her first game for Hawks this season. Her team are placed eighth in NBL1 group. But this is still an early stage of the season and everything may happen. Farnworth-Edmondson is also a member of the New Zealand senior national team. #4. Guard Jordan Hunter (172-90, college: SEMO, currently plays in Australia) managed to help West Adelaide Bearcats in a victory against the 11th-ranked Lions (0-5) 83-64 in the Australian State League (second division) last Saturday. She scored only one point and grabbed 7 rebounds in 36 minutes. West Adelaide Bearcats (3-2) are placed fourth in Premier League. But the season just started, so everything may happen. This year Hunter's overall stats are: 5.4ppg, 3.2rpg, 1.8apg and 2.0spg in five games. She is also New Zealand national team player. #5. International forward Jessica Bygate (186-92, currently plays in Australia) contributed to Falcons' victory against the 16th-ranked Frankston Blues (0-1) 74-62 in the Australian State League (second division) on Saturday night. Bygate scored 6 points and grabbed 7 rebounds. Waverley Falcons (1-1) are placed tenth in NBL1 group. But the season is still in it's first stage and everything can happen. Bygate's total stats this season are: 3.0ppg, 5.0rpg and 2.0apg. She plays currently for the New Zealand national team. #6. Guard Rebecca Ott (182-94, currently plays in Australia) contributed to a Knox Raiders' victory against the ninth-ranked Lady Cobras (1-1) 86-79 in the Australian State League (second division) in Saturday night's game. Ott was the top player that evening. She scored 20 points, grabbed 6 rebounds and dished 5 assists in 36 minutes. It was her first game for Knox Raiders this season. Her team are placed seventh in NBL1 group. But there are still lots of games to play and it's a long way to go. Ott is a former international player as she played for the New Zealand senior team two years ago. #7. An experienced U18 international swingman Sofia Kennedy (174-0, currently plays in Australia) is a teammate of previously mentioned Jordan Hunter and both played together in the last Australian State League game. Kennedy helped Bearcats win their game against the 11th-ranked Lions (0-5) 83-64. She scored 6 points in only 10 minutes. This year Kennedy's total stats are: 1.6ppg and 2.0rpg in five games. She is also New Zealand U18 national team player. #1. Keziah-Brittany Lewis (178-G-95, college: Kent St., currently plays in United Kingdom) was the major contributor in a Newcastle Eagles' victory against the closely-ranked Riders (16-3) 96-87 in the British WBBL on Saturday night. Lewis recorded 21 points and grabbed 6 rebounds in 27 minutes; not bad, considering it's only her second season in pro basketball. It was the game of the round between two top 4 ranked teams. Newcastle Eagles (19-8) is placed third in the WBBL. It was her team's fourth consecutive victory in a row. There are only three games left until the end of the Regular Season. So now every game will be critical. This year Lewis' overall stats are: 4.7ppg and 2.6rpg in 18 games she played so far. She has a dual citizenship: New Zealand and Cook Islander. #2. Faith McKenzie, who plays in the Australian State League (second division) could not help Ballarat Rush (0-1) to beat Spectres (1-2). She cannot count Saturday's game as one of the best ones. McKenzie scored only one point. It was her first game for Ballarat Rush this season. The 14th-placed Ballarat Rush (0-1) was crushed 89-68 on the road by the higher-ranked Spectres (#11) in the NBL1 group. Brigham Young University went down to Stanford University in the second round of the NCAA Tournament on Tuesday leaving Esra McGoldrick (188-F-99) as the only Kiwi woman left competing at the Big Dance. Cantabrian McGoldrick and North Carolina State University are headed to the NCAA Women's Tournament Sweet 16. The Wolfpack defeated Kentucky 72-57 on Tuesday to advance from the round of 32 for the second consecutive season. The Wolfpack now head to Greensboro to take on Iowa on Sunday (NZT). Unfortunately they won't be joined by BYU and its trio of Kiwis (Shalae Salmon, Khaedin Taito & Kaylee Smiler) as the Cougars, trailing by just two at half-time (31-29), lost 72-63 to Stanford. Salmon grabbed a couple of rebounds and scored with her only shot as BYU finish the season with a 26-7 record and the West Coast Conference title locked away in the trophy cabinet. Fordham University Rams with its trio of Kiwis saw its season end at Syracuse, beaten decisively 70-49 in the first round. Mary Goulding brought the curtain down on her career at Fordham with 8 points, 10 rebounds and 3 assists in 39 minutes. Kendell Heremaia had 6 points and 5 rebounds whilst Zara Jillings chipped in with a couple of assists and a rebound. The Rams finish the year with a 25-9 overall record, tied for the third-most victories in school history and capped with their second ever Atlantic 10 championship. In other news Hutchinson Community College, with former Westlake Girls forward Keeley Tini in its lineup, went down 60-54 to New Mexico College in the semi-final of the NJCAA (Junior College) National Tournament. Hutchinson were attempting to make it to is fourth National Tournament Final.